The gentleman asked if I would assist in commemorating one of his friends, a Native American artist who had lived and worked in Arizona and who had recently died. The gentleman had met this lady artist when she was alive, and he had bought a painting from her. The painting was an oil on canvass. The subject of the painting was a portrait of an old Native American. 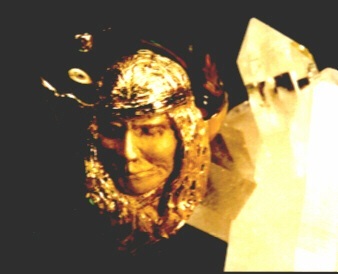 The artist had christened that painting “The Old Wise One”. The gentleman and his wife had come to love that painting as well as they loved the artist who created it. The painting held a special place in their home. 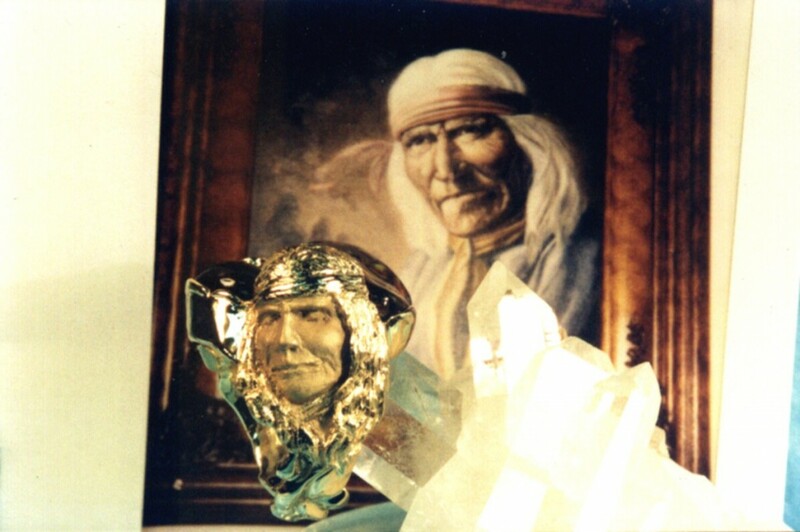 He asked if I could create in gold, on the side of a finger ring, a duplication of that Old Wise One depicted in the painting on the photograph. I offered that I could create my interpretation of that Old Wise One. The gentleman then produced a collection of Arizona fire agates and asked me to incorporate some of those stones into the design for the finger ring. Below are some photographs of the finished work. 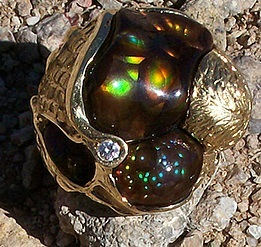 As I often did in the 1990s when photographing my work, I mounted the finger ring on a cluster of quartz crystals. Pictured above is the finished ring with the client’s Polaroid picture of the painting placed behind the ring. 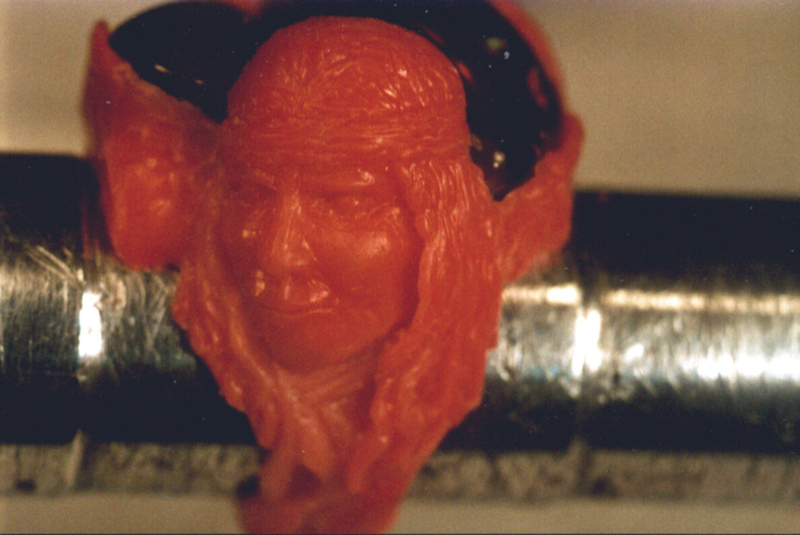 Below are photographs of this finger ring, and also an “in-process” (incompleted) wax model which was nearing completion. 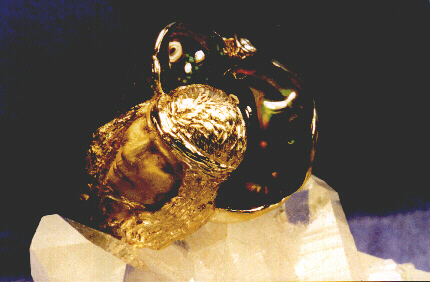 The wax model was built one drop of wax at a time, was carved and textured around the three Arizona Fire Agates and the single round diamond. I did not keep count of the hours involved in the design’s creation. Sensing the importance of this design to the gentleman who commissioned the work, I gave every consideration to the work. The project spanned more than two months, during which time I also fulfilled our store’s demands and the needs of our many other customers. 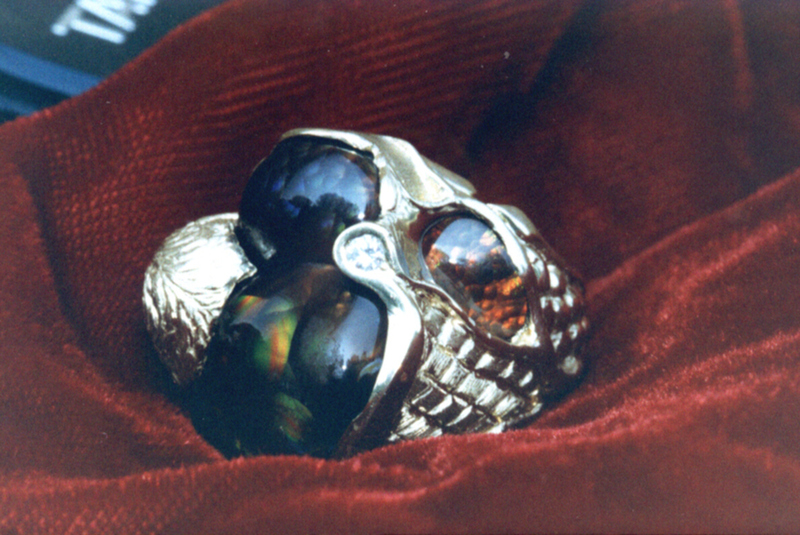 The hours which went into the making of this finger ring were taken from my personal time, my “free time”, so that normal business pressures would not unconsciously creep into the evolving design as I added one drop of wax after another to arrive at the completed design.